The Florida East Coast's Key West Extension, or the Florida Overseas Railroad as it was officially known, became one of the railroad industry's most celebrated accomplishments even after it was destroyed by the Labor Day Hurricane of 1935. The extension operated for just over twenty years before it was heavily damaged and with the FEC being bankrupt at the time it was unable to repair the bridges and right-of-way. Thus, the property was sold to the state of Florida, which subsequently turned the former railbed into a major roadway, the Overseas Highway (U.S. 1), which still serves Key West today albeit the former railroad bridges no longer carry vehicle traffic. The Florida East Coast Railway (commonly known as the FEC), like many classic American railroads has had a very rich and interesting past. However, what happily sets it apart from those railroads is that it is not a fallen flag, and continues to operate today under its original name just as it has for the past 112 years. The FEC of today currently hugs Florida’s Atlantic coast and runs basically north to south, serving the cities of Jacksonville, St. Augustine, West Palm Beach, and Miami. The Florida East Coast Railway originally had its beginnings in 1895, on September 7th to be exact as that was the date when the FEC was officially dedicated by its most prominent and original owner, Henry Flagler (who is known not only for his wealth, but also for a number of successful businesses, such as partnering with John Rockefeller of Standard Oil fame), who purchased the Jacksonville, St. Augustine & Halifax River Railway and renamed it (because this railroad began the FEC “empire” for many years, until just recently when it moved to Jacksonville, the railroad’s headquarters were located in St. Augustine). However, the railroad actually had its beginnings much earlier than that, as its predecessor railroads date all the way back to 1858 with the narrow-gauge St. John’s Railway, which operated, between Tocoi and St. Augustine, Florida. What spurred FEC president Henry Flagler into building the Extension was the announcement by the United States in 1905 that a canal linking the Pacific Ocean and Gulf of Mexico would be constructed, the Panama Canal. 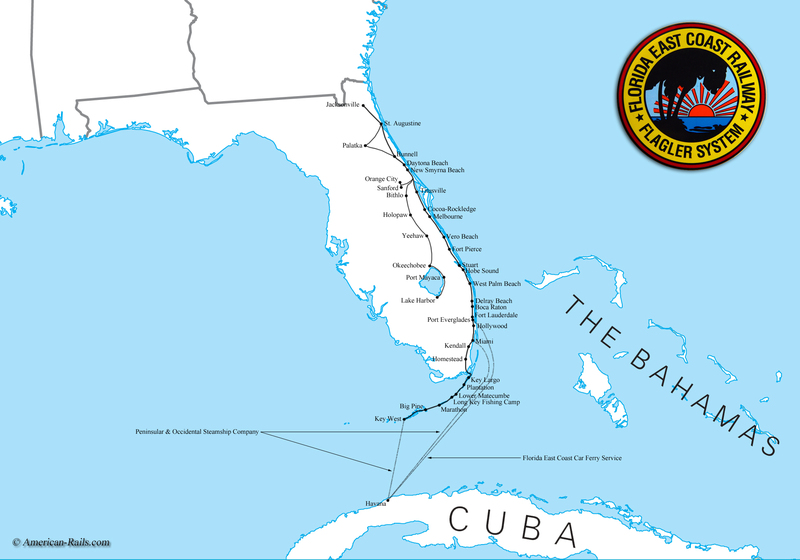 Flagler's idea was to connect Key West as a means of not only converting the United States' most southern city into an important port and trade route with Cuba and Latin America but also as a vital supply stop for steam ships entering or exiting the canal (particularly to refuel). Soon after it was announced the Panama Canal would be constructed Flagler incorporated the Florida Overseas Railroad to build a rail line which stretched from Kendall (directly south of Miami), across Florida's Keys and a connection with the city of Key West, whose population was about 30,000 at the time. The Florida East Coast Railway's extension covered a total of about 145 miles. The elderly Flagler nearly bet everything on the railroad with his gamble to stretch the company to Key West. The Florida Overseas Railroad was built to the highest construction standards at the time, often utilizing concrete viaducts to bridge the distances across the tiny Keys. At one time or another the FEC was employing more than 4,000 men to build the Key West Extension and the costs were driven up further by the fact that no fewer than three hurricanes delayed construction. 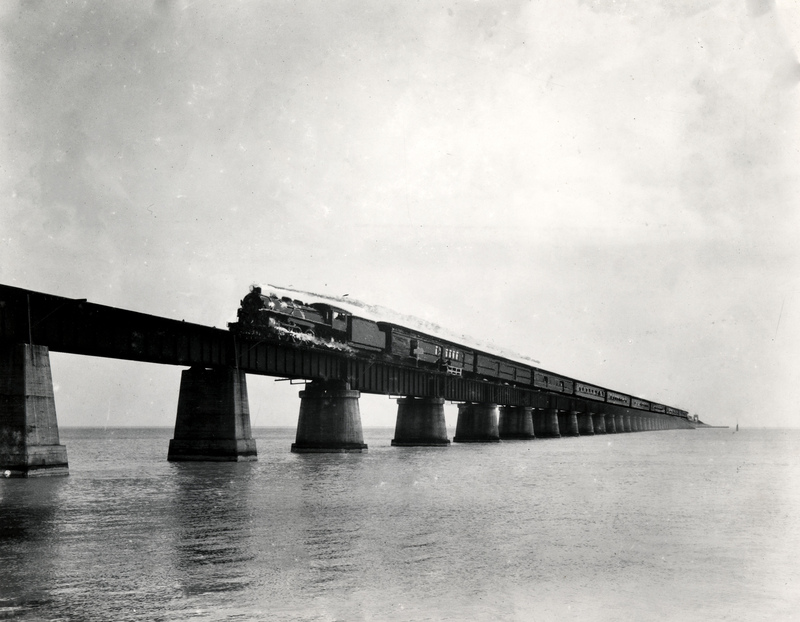 The extension required more than two-dozen bridges to reach Key West with the longest structure the Seven Mile Bridge, connecting Marathon with Big Pine Key. It took Flagler and the FEC seven years to complete the Extension with the route officially opening on January 21, 1912. A day later the 82-year-old Flagler rode the entire line to Key West aboard his private business car. Most had scoffed at the idea that such a railroad could be built initially calling the extension "Flagler's Folly". However, once completed it was hailed at the time as the "Eighth Wonder of the World". Overall the project had cost roughly $50 million, which in today's currency would be about $113.5 million. Unfortunately, the Extension never did reach its full potential. Despite Flagler's belief that Key West would become a major port for trade with Cuba, Latin, and South America this never materialized. And, neither did the hope that Key West would become an important refueling stop for ships. As sailing vessels were able to travel further and further without the need to refuel, the resort town lost its status as a maritime resupply hub. Then, the category five Labor Day Hurricane of 1935 devastated the Keys and the Florida Overseas Railroad killing more than 400 people, overturning the train dispatched to evacuate folks off the islands, and wrecking the extension. To see a collection of historic photographs please click here. With the FEC already in bankruptcy, which was partially due to the incredible resources it spent on building the extension the railroad was unable to rebuild the route. As such it sold the entire right-of-way and remaining bridges to the state of Florida for $640,000. In turn the state rebuilt the right-of-way into a major highway, U.S. 1, serving the keys and reaching Key West. The original railroad bridges remained in use carrying vehicular traffic until the 1980s when the state began constructing new bridges to serve the islands. However, today, the original railroad structures remain in place and mostly used as fishing or walking piers and are listed on the National Register of Historic Places.